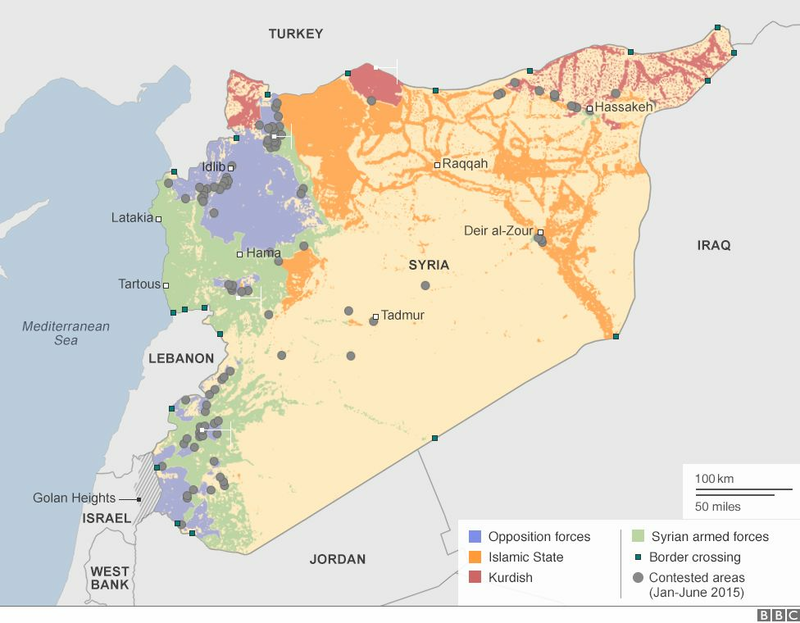 Territorial control in Syria has changed many times since the country's uprising began more than four years ago, with long periods of attrition characterising the conflict. However, there are now signs the battlefield is transforming, with extremist and Islamist groups establishing a momentum of their own and the forces of Syrian president, Bashar al-Assad, under mounting pressure on severalsl fronts. 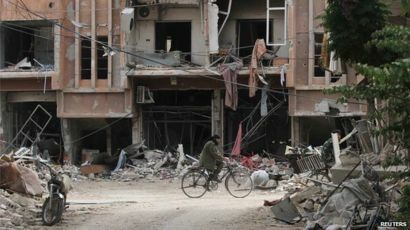 Homs, Syria's third largest city, has been the scene of heavy fighting. It was dubbed the 'capital of the revolution' after residents embraced the call to overthrow the president in early 2011 and much of the city fell under the control of the opposition. However, government forces gradually took back areas held by rebels and in May 2014, the city was fully regained by regime troops. Fighting continues to the east of the city between the government, IS and other opposition forces. The Syrian capital and its outskirts remain a key strategic area of control. 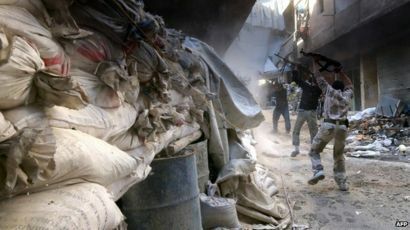 While the regime has succeeded in using sieges and intensive air strike campaigns to negotiate truces with various armed groups in and around the city, fighting continues between government forces and opposition fighters. Government forces have reportedly begun fortifying approaches to Damascus and Latakia in the north west in order to protect their core territory. 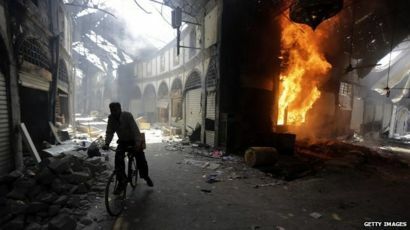 Fighting broke out in Syria’s largest city in July 2012 with rebels taking control of a number of districts. However their offensive stalled and the battle became a war of attrition. The city continues to be a key battleground between Syrian government forces, rebels and jihadists. Fighting and government air strikes have left thousands dead, and destroyed more than 60% of the Old City, a Unesco World Heritage site. Kobane, a town populated by Kurds on the border with Turkey, has been one of the most high-profile battlegrounds of the conflict. The border town was besieged by militants from the Islamic State group (IS) in 2014. But, after months of fighting, Kurdish militia, backed by US-led air strikes, took back control of the town in January 2015. Since then, IS have launched a series of counter-attacks along the Turkish border, including against Kurds in Kobane. Map sources: areas of control and border crossings from the Syria Needs Analysis Project. The organisation's primary source is a database of conflict incidents as recorded by the Syrian Observatory for Human Rights. All other geographical detail from humanitarian organisations and Google. In recent months, Islamic State (IS) - the extremist group that grew out of al-Qaeda in Iraq - has made significant gains in the country's central corridor. At the same time, other Islamist rebel groups - including the al-Qaeda-affiliated al-Nusra Front - have contributed to other advances, such as the seizure of the provincial capital of Idlib in north-western Syria. The Institute for the Study of War (ISW) predicts this renewed rebel strength will likely lead to additional upheavals across Syria's previously stalemated battle lines in the future. Elsewhere, primarily moderate Syrian rebels have made gains in the southern cities of Deraa and Quneitra, where groups have remained relatively united. In June, they seized the Syrian government's largest military base in Deraa, though this is far from the rebels' stated goal of reaching rural Damascus. To the north, Kurdish forces have been battling a series of deadly IS counter-attacks. The jihadist group had, until then, suffered a series of defeats in areas along the Turkish border since being forced to withdraw from the town of Kobane in January. 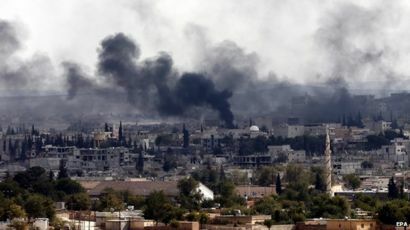 Most recently, the Kurdish Popular Protection Units (YPG) - supported by rebels and US-led coalition airstrikes - recaptured the border town of Tal Abyad, to the east of Kobane, in June. For the Syrian government, battling this fractured opposition has taken its toll, according to the ISW. The regime is facing a manpower shortage and has attempted to counteract it with conscription campaigns and an increased use of Iranian-sponsored paramilitary forces, it says. Over the coming months, the ISW predicts that jihadist groups, such as IS and al-Nusra Front, will gain in influence and power, while Iran - the Syrian government's strategic ally - and Saudi Arabia - a backer of rebel forces - will escalate their involvement in Syria. The conflict has its roots in protests that erupted in Deraa city in March 2011 after the arrest and torture of some teenagers who painted revolutionary slogans on a school wall. Opposition supporters - angered by the government's use of lethal force to crush pro-democracy demonstrations - first began to take up arms to defend themselves and later to expel security forces from their local areas. As the country descended into civil war, armed rebel brigades battled government forces for control of cities, towns and swathes of countryside. During 2012, rebel forces enjoyed a series of tactical successes, taking control of several outlying suburbs and towns around Damascus, and ousting troops from large parts of the second city of Aleppo. However, the advances were not decisive. By the start of 2013, the government began to recapture opposition strongholds around the capital, while there was stalemate in Aleppo, with the city divided into rebel and loyalist-controlled sectors. Then, in June 2013, government troops backed by fighters from the Lebanese Shia Islamist movement, Hezbollah, recaptured a number of rebel strongholds. Rebel forces have been affected by deep divisions among groups. Secular moderates are now outnumbered by Islamists and jihadists linked to al-Qaeda, whose brutal tactics have caused widespread concern and triggered rebel infighting. The escalating violence and IS advances have had a significant humanitarian impact on Syria and its neighbours. Syria is now the world's biggest internal displacement crisis, with more than seven million people forced from their homes but remaining in the country. Meanwhile, more than 4 million people have fled the country's borders, mainly taking refuge in surrounding countries. Turkey and Lebanon have each taken in more than one million Syrians, while Jordan, Iraq and Egypt have become home to hundreds of thousands more.